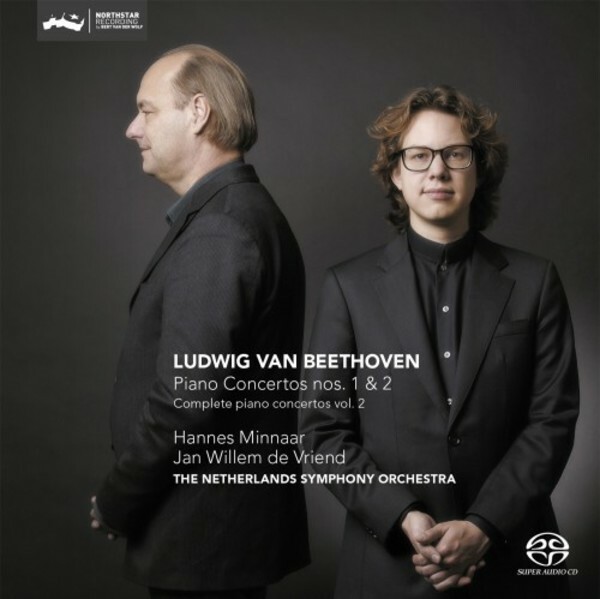 The second volume in Hannes Minnaar’s ongoing series of Hybrid SACD recordings of Beethoven Piano Concertos in which the young Dutch pianist is accompanied by his compatriots, Jan Willem de Vriend and the Netherlands Symphony Orchestra. Strength, smoothness, humour. Those were among Beethoven’s own playing characteristics - identified by his pupil and fellow composer Carl Czerny - and they are certainly to be found in these performances of the Piano Concertos by Hannes Minnaar, surely among the most interesting and sought after pianists of his generation. On this disc Minnaar, De Vriend and his orchestra play the concertos in reverse order. Artistically, this is easy to justify: introduced as it were by the more balanced, more modest Piano Concerto no.2, no.1 radiates all the more festiveness (trumpets, clarinets and timpani have come to join the orchestra). Perhaps the lovely, gentle, almost feminine B flat major of Concerto no.2 would not have been able to hold its own after the male and martial C major. But there is something else: the Second Piano Concerto actually came first. It was composed earlier, at least in its initial version. De Vriend and his Netherlands Symphony Orchestra have also released a complete cycle of Beethoven Symphonies on Challenge (available on five separate discs and collectively in a box set). Together with violinist Isabelle van Keulen, Hannes Minnaar has previously recorded Beethoven’s Complete Sonatas for Piano and Violin on the Dutch label.